These photographs are all from the Fantasy Masquerade at Masque 6. Sorry about some of the lighting. I think tech had some coloured lights on during the photo shoot. 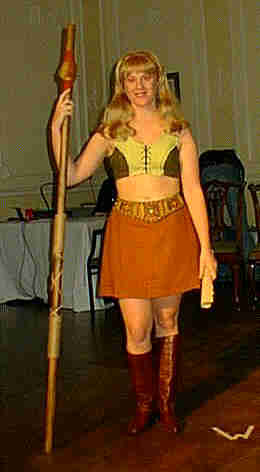 Cathy Holroyd as Gabrielle from the Xena TV series. 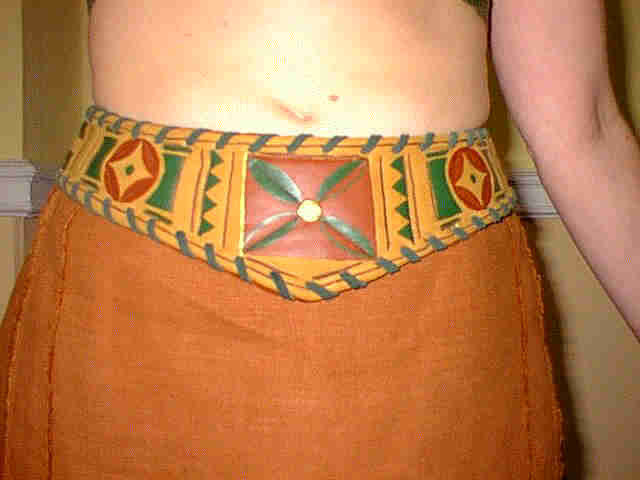 A close-up of the belt from Cathy's costume. Yes, it is hand-made, and getting the design exactly right involved a lot of careful study of videos of Xena episodes. 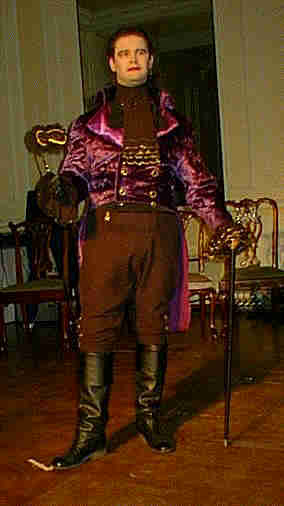 Tom Nanson as the Purple Pimpernel. 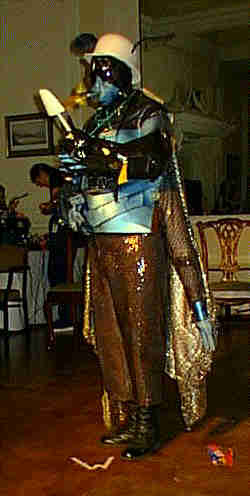 This one won the Workmanship prize, despite hair and make-up being by one Cheryl Morgan. I was most impressed with the spray-in, wash-out hair colour that Tom had bought. Shame the photo doesn't show the purple streak down the centre of his hair. The Bedrock Yuppies. Look carefully at those shoes which are hand-made in soft leather. Both contestants are also wearing hand-made leather knickers. The Tourist from Planet Bug makes good use of his long tongue to lick an ice cream. In case it isn't clear from the photo, the tongue is one of those extensible hooter things that kids love. 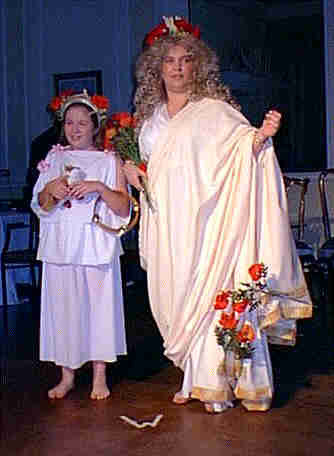 Demeter and Persephone, long before all those little family dramas. 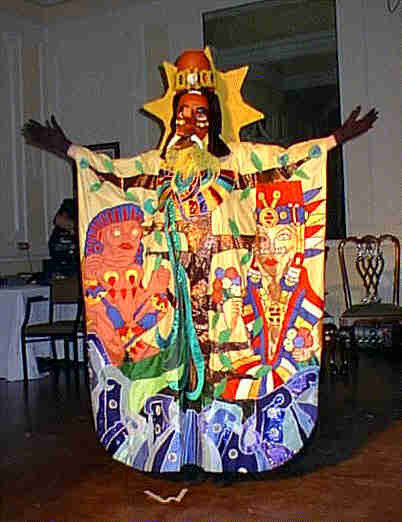 Mikki Dennis showing one of the four panels from her winning entry, The Wind Brings Music to the World. There is another panel on the back, and two more were on an overlay that Mikki removed during the presentation. 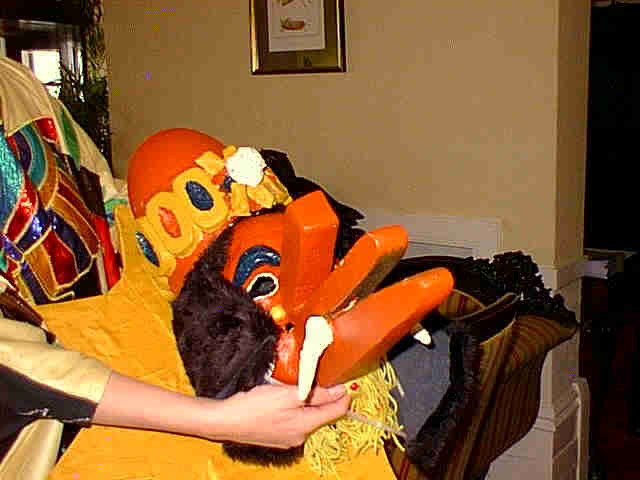 A close-up of the headpiece from Mikki's costume.